Intent-based networking might be the future of networking, but it needs to be more than just another networking strategy that offers advanced automation and simplified provisioning. Intent-based networking has the potential to propel network automation and provisioning. But this newfangled networking concept is still mired in immaturity and confusing marketing buzz, most of which ignores IBN's differentiating factor. 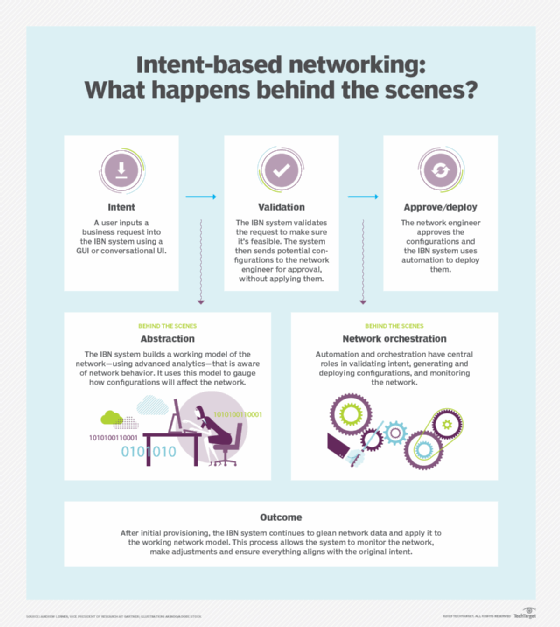 Essentially, intent-based networking (IBN) is a new way to operate a network, according to Andrew Lerner, research vice president at Gartner. While intent-based networking automates provisioning, its true value resides in its ability to provide continued assurance that the network is doing what it should, he said. The first step is to input a request into the IBN system using a GUI or -- hopefully -- natural language via a conversational UI. The request could be a command for an interface change, a routing protocol, a network service configuration or traffic steering, among other possibilities, Lerner said. Once the IBN system receives the request, it begins verifying if the request is actually possible. To perform this validation, the IBN software uses an abstraction layer -- a working model of the network that is aware of network behavior. The system tests configurations against this model to see how they might affect the network. The IBN software then relays the potential configurations necessary to accomplish the request. That's when the network engineer approves or rejects the configurations. If approved, the IBN system uses orchestration and automation to deploy the configurations using command-line interfaces, API calls, the Simple Network Management Protocol or other methods to communicate with the underlying network infrastructure, Lerner said. That's Day Zero in intent-based networking. But these steps only scratch the surface of IBN's potential, according to Lerner. Most of the hype around intent-based networking focuses on faster provisioning. The true allure of intent-based networking, however, is its ability to validate that the network is doing what it should after the initial input, Lerner said. While this continued validation can certainly apply machine learning and AI, intent-based networking also uses mathematical formulas and analytics, he added. The IBN system pulls metadata -- packet data, syslogs, flow data and more -- from the network and applies it to the abstraction model. It can then autocorrect, close loops and self-heal when something goes wrong. It's this Day-Two assurance that makes intent-based networking so promising, Lerner said. Intent-based networking is still young, but enterprises can start preparing their networks now. To start, Lerner recommended organizations prioritize network infrastructure purchases that offer high levels of programmability and automation. This includes support for Puppet, Chef, Ansible and published RESTful APIs that are conducive to abstraction. Enterprises equipped with this foundational infrastructure now will be better able to support the mature IBN systems of the future. What do you think is the biggest risk with intent-based systems?